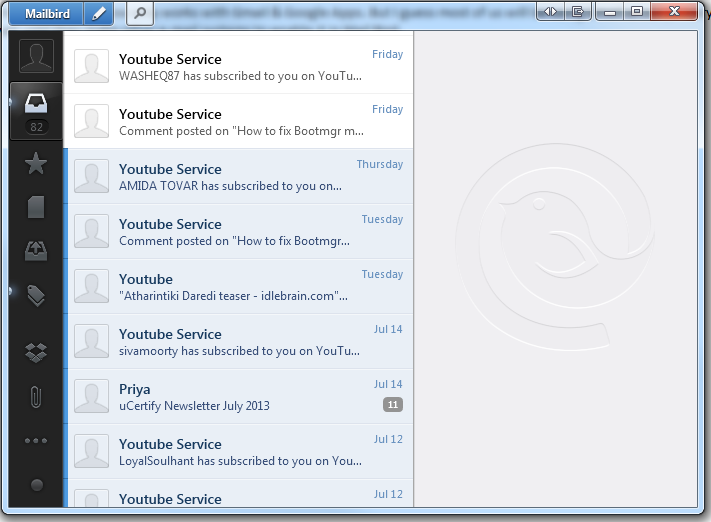 MailBird is an elegant looking and fast E-mail client for Windows. As of now only works with Gmail & Google Apps. It can link with Facebook and display images for your contacts. It's also packed with many open source applications and add-ons that you can use along with MailBird to enhance your experience such as Dropbox, Facebook, Google Drive, etc. The free version has limited options and limits the number or email accounts, but it is free forever. Might be good as long as you don't have to migrate email & settings from Outlook. It works with Yahoo and Microsoft and lots of other IMAP accounts. Until they provide a means of importing contacts/messages/etc from your existing email client this will never be worth more than a 2-star rating. Not bad. I wish I had some more control over it though like I did with the client that was built into old Opera. Maybe @TuxManXP should go away instead of leaving a negative review. I'm going to try this for my 4 Google Apps accounts as well as my 2 regular GMail accounts b/c Thunderbird, as of late, has been having massive issues with continuously trying to synchronize folders (labels) that I have already viewed items in. Giving it an initial 4 star rating for the attempt and to counter idiocy like TuxmanXp's. 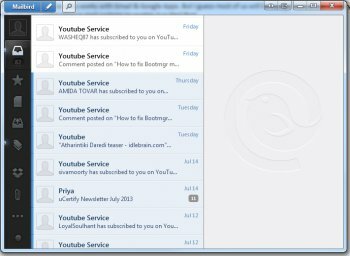 This is the best email app for Windows! Considering that it is still in beta, I am really really impressed. Cannot wait to experience the next development releases!! Definitely sticking to this one. They are doing it right. Man I love this app. It's sleek, fast, and it's got stuff like quick open and quick compose and web-app integration and saved search...I've never gone through my email this quickly. I'm seeing Inbox 0 like 4 days a week when I used to see it one a month if I was lucky. Uhm, seriously... "only Gmail", no GnuPG support, a clumsy interface... go away and come back when it's usable. Format of mail is not supported by the most popular email migration tools. Bottom Line: Might be good as long as you don't have to migrate email & settings from Outlook. Pros: It works with Yahoo and Microsoft and lots of other IMAP accounts. Cons: It does not display pure black text !!!! Bottom Line: It works with Yahoo and Microsoft and lots of other IMAP accounts.